1) Jb. Abu Hasem Khan Choudhury, Hon’ble M.P. 2) Jb. 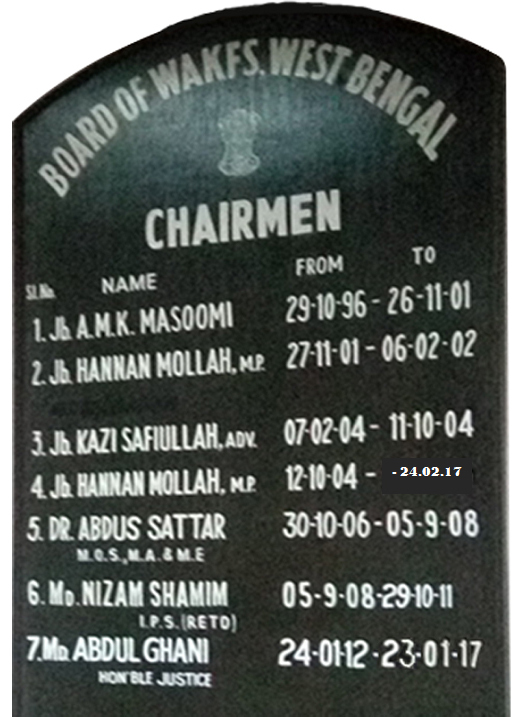 Nadimul Haque, Hon’ble M.P. 3) Jb. Haji Sk. Nurul Islam, Hon’ble M.L.A. 4) Jb. Abu Taher Khan, Hon’ble M.L.A. Jb. Sadrul Alam, W.B.A.& A.S.
Jb. Md. Intikhab Alam, W.B.L.S. The main functions of Board of Auqaf, W.B., is the management, control, and superintendence of the enrolled Waqf Estate. The Board of Auqaf, W.B., has mainly the following sections to oversee day to day administrative matter. a) Board Section :- To maintain proceedings of the Board and Sub-Committees and policy matters & its execution. b) Establishment Section :- To maintain cash books and ledgers, pay salaries and official Records & Registers. c) Cash Section :- To disburse payment and maintain its Records & Registers. e) Accounts & Demand Section :- To collect Waqf contribution (revenue), assessment of accounts & audit inspection of Waqf Estates and maintain its Records and Registers and preparations of year wise abstract. f) E.C. & Misc. Section :- To appoint Mutawalli, mutation of Waqf properties & amendment of Waqf register and litigation in the mater of the Waqf Estates. g) Misc. E.C. Section :- To enroll properties as Wakf and maintain its Records and Registers. h) Development & Anti-Encroachment Section :- To develop Waqf properties and take action for removal of encroachment and recovery of Waqf properties and maintain its Records and Registers. i) Reference Section :- To keep and maintain Waqf records and supplying & racking files and maintain its Records and Registers. j) Receiving & Dispatch Section :- To receive and delivery of letters with acknowledgment and maintain its Records and Registers. k) Direct Management Section :- To deal with the Waqf Estates placed U/S 65 of the Waqf Act, 1995 and maintain its Records and Registers. 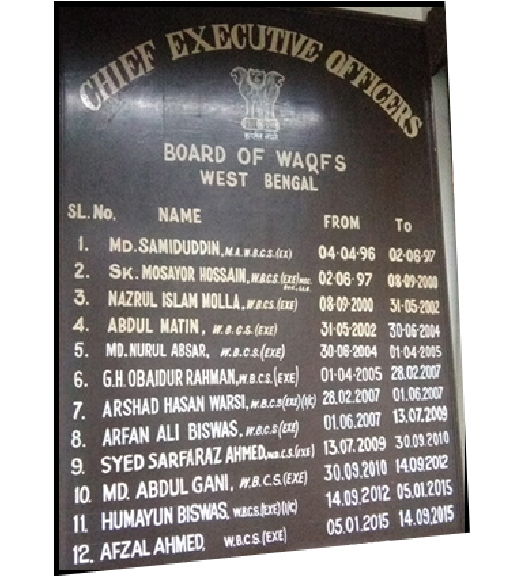 m) Hostel Section :- Hostel Management with payment of salary & other expenditure of Boys and Girls Hostel in different district of West Bengal as well as to see the establishment matter of the Hostel Employees. 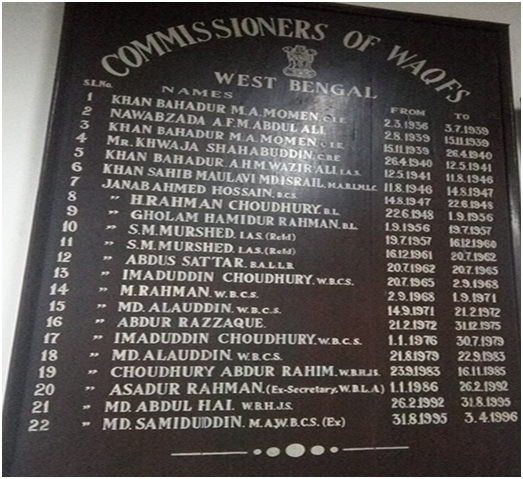 n) Imam & Moazzin Section :- Preparation of list of Imams & Moazzins and disbursing of their remuneration every month in different districts of West Bengal.